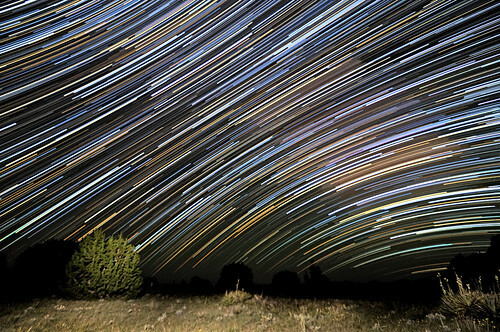 The Caprock Canyonlands area in SE Colorado offers some of the best night sky in the state for viewing the Milky Way. The color of the star streaks relate to the temperature of the star, with blue being the hotter and red the cooler overall. 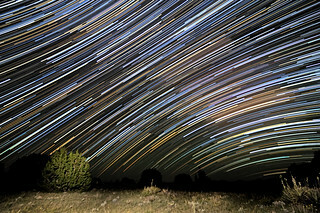 Image Notes: For this star trails image I used 195 consecutive 30 second (97.5 mins worth) exposures stacked via brightness blending mode in PS. Then an image I light-painted was used for foreground detail, manually blended via luminosity and hand-painted masks. This shot was taken very near the location of my previous posting, only the angle was adjusted to keep the Milky Way in center at the start of the series.